Frequency is a description of how often something reoccurs. For example, if a bill comes due once per month, it has a frequency of once per month. If your car is running at 600 RPM or 600 revolutions per minute, the crankshaft is rotating and returning to the same position 600 times per minute. This can be converted to revolutions per second by dividing by 60 seconds/minute which results in 10 revolutions per second or 10 cycles per second which is expressed as 10 Hz or 10 hertz since “hertz” is defined as “cycles per second”. In the world of electronics, things happen much faster, so frequency is expressed in hertz, kilohertz, megahertz or gigahertz, etc. One gigahertz = 1,000 megahertz = 1,000,000 kilohertz = 1,000,000,000 hertz or 1,000,000,000 cycles per second. So if your computer is operating at 2 gigahertz, it is completing 2,000,000,000 cycles of signal processing every second. Frequency devices on this web site change polarity at the programmed frequency. They transition from zero volts to a positive value, back thru zero volts to a negative value and back to zero volts at the programmed number of times per second. So, this cycle reoccurs at the programmed frequency written in hertz in the computer program. Correctly spelled “micro-current”; this is a very small amount of electrical current flow which is expressed in units of micro-amperes. The Einstein Medical Research Institute discovered that as little as 100 micro-amperes can change the outer protein layer of a virus so that it cannot penetrate cells to replicate. The micro-current products on this web site can deliver over 20,000 micro-amperes of electrical current at full power. They have plenty of reserve power to deliver the programmed frequency where it’s needed by delivering it in the form of micro-current. A Rife Machine is a microscope. Frequency devices were designed and built by Phillip Hoyland for Royal Raymond Rife in the 1920s and 1930s. They were used to destroy the Cancer, Typhoid and other disease causing micro-organisms by delivering frequency to induce sympathetic resonance in the organism. They are not sold commercially today because they violate FCC regulations and interfere with telecommunications such as radios, cordless phones, etc. Modern equipment that use the same principle of sympathetic resonance but do not violate FCC regulations can be found on this web site. HOW CAN FREQUENCY DESTROY BACTERIA OR VIRUSES IN MY BODY? To be effective in destroying micro-organisms such as bacteria or viruses, frequency must be delivered in a form that can disrupt their metabolic mechanisms. Micro-current (waves), Plasma waves, Radio Waves and Light Waves all work to accomplish this goal. They do this by alternately attracting and repelling the cellular structure of the organism thru the alternating polarity of the frequency of the waveform. This causes the cell walls to rupture, disrupting the metabolic mechanisms, destroying the organism. Megahertz Micro-Current devices use an ample amount of micro-current, whereas Computerized Ray Tube devices use a combination of Radio Waves, Light Waves, Plasma Waves and a very small amount of micro-current to accomplish the same thing. The Plasma waves penetrate better, but the Megahertz Micro-Current devices deliver more power. The best combination is the BCX411 Computerized Ray Tube Professional that use all the afore-mentioned methods to deliver the frequency. It uses plasma tubes to get penetration from the plasma wave and the Megahertz Micro-Current amplifier to get the power from the micro-current. All products on this site are protected by a one year warranty covering both parts and labor. Yes, the following takes advantage of the NASA discovery that a monochrome light modulated at a specific frequency can dramatically decrease wound healing time and have beneficial effects on the eye. It plugs directly into the back of the equipment, operates automatically with a program and can be run simultaneously with plasma tubes and/or micro-current contacts. 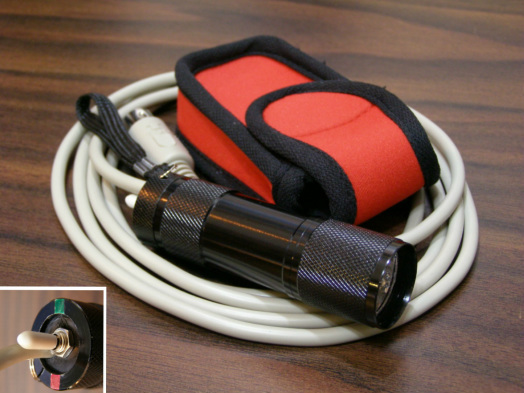 The Photon Probe Pro produces 2 different monochrome light colors which are modulated by the Megahertz Amplifier or Computerized Ray Tube 6 or later. Switchable to red, green or off. Red output is 46,800 millicandelas at 640 nanometers wavelength. Green output is 52,500 millicandelas at 527 nanometers wavelength. Operates to over 1 megahertz (1,000,000 Hz). Used for cataracts, glaucoma and macular degeneration. Used to stimulate the production of collagen and elastin to reduce wrinkles. Used to increase mitochondria efficiency and regenerate tissue for wound healing. Comes with a 6 Ft cable and protective case shown. Professional quality made from machined aluminum housing and medical electronics. No medical claims are made for this product. It does not prevent, diagnose, treat or cure any disease.